Today I will show you how to visualize not just the solid figures but the disks and washers used in computing the volume using Winplot. The next post will show how to draw shells. Winplot is a free program. Click here for Winplot and here for Winplot for Macs. 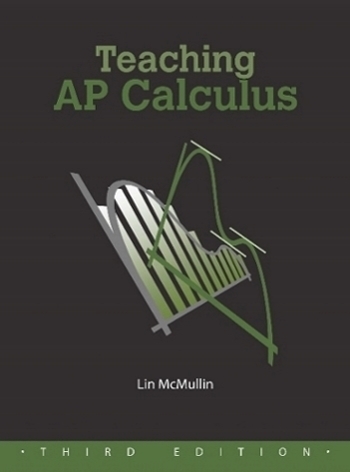 For the example we’ll use the situations from the 2006 AP calculus exams question AB1 / BC 1. The students were given the region between the graphs of y = ln(x) and y = x -2. In the first part they were asked to find the area of the region. To do that they first had to determine, using their calculator, where the curves intersect. The x-coordinates of the intersections are x = 0.15859 and x = 3.14619. Go to the Anim button, choose “B” (Anim > Individual > B). You may now move the “Riemann rectangle” (which, of course, is very thin, approaching 0) across the region. Next we will produce the 3D images. Adjust the viewing widow with the 4 arrow keys and the Page Up and Page down keys. Add the axes with Ctrl+A. Return to the “surface of revolution” window and choose the second function from the drop-down box at the top. not change anything else. Click “see surface” and the second curve will be added to the graph. Change the “low t” value to 0 and the “high t” value to 1. Change the “u hi” to 2pi@R. Click “ok.” The window should look like the one below. 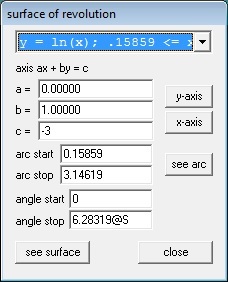 To show the line y = –3, in the 3D window go to Equa > 2. Parametric and enter the values shown in the box below and click “ok.” A short segment at y = -3 will appear in the 3D window. 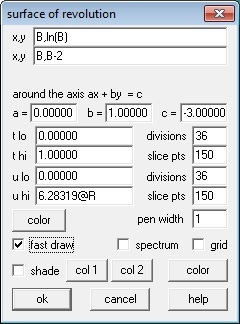 For the “B” slider make “set L” = 0.15859 and the “set R” to 3.14619 (the intersection values). For the “R” slide make “set L” to 0 and “set R” to 2pi. Adjust the R and S sliders to 0 and the B slider to its minimum value. Save everything just to be safe. The extension will be “.wp3.” Later you can open this file from the 3D window, but it will no longer be in touch with the 2D window even if you save that. Move first the B slider, then the R slider, then the B slider again and finally the S slider to explore the situation. In the video at the top you will see this example with these things happening in order. The Riemann rectangle rotated into a washer using the R slider. The washer moving through the curves using the B slider again. The washer moving through the solid using the B slider. The solid rotated with the 4 arrow keys. The next post will show how to do a similar animation for the cylindrical shell method.